PARIS, France (CNN) -- Investigators are "getting a little bit closer" to determining what caused an Air France airliner to disappear into the Atlantic Ocean, but there are no answers yet, a French investigator said Wednesday. The tail fin of the Airbus A330 that crashed in the Atlantic is unloaded this week in Recife, Brazil. The Airbus A330 crashed June 1, killing all 228 people aboard. Fifty bodies and a few parts of the plane have been recovered. Searchers are especially interested in finding the aircraft's flight data recorder, assumed to be resting at the bottom of the ocean. "I understand that the families [of the victims] want to know what happened," Paul-Louis Arslanian, director of the BEA, the French accident investigation board, said at a news conference in Paris. "The only message I can give them is that at the moment ... we are working as quickly and intensely as possible in order to one day find out what happened and what we may do in order to make aviation safer." 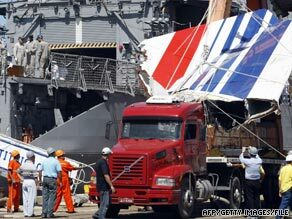 It is "virtually certain" that authorities will not be able to recover all the parts of the plane, Arslanian admitted. The exact location of the crash is not known because the plane was not within any controller's radar when it disappeared, the flight data and cockpit voice recorders have not been recovered, and ocean currents have moved the bodies and debris that have been found. A large number of French, Brazilian and American ships are searching the waters, and the BEA has asked the European Space Agency to provide satellite imagery of the search area, said Olivier Ferrante, chief of the BEA search mission. Investigators are looking at the possible role of airspeed sensors known as pitot tubes, among other factors, but Arslanian cautioned reporters not to speculate about what happened. "It is far too early to imagine scenarios one way or another," he said. Theories range from electrical failure caused by a lightning strike to terrorism. "As an investigator, until you know exactly what caused it, you need to leave everything on the table," Capt. John Cox, a longtime pilot with expertise in global air safety, told CNN. Foul play is possible, "but there's been nothing that shows me that it would be a prime suspect," he said. Investigators on land have been studying the aircraft fragments that have been gathered, but Arslanian offered no information on their findings. Investigators are likely to test for explosive residue, said CNN security analyst Mike Brooks, who as a member of an FBI response team has participated in air disaster investigations. As for the bodies, Brazilian officials have conducted all the autopsies, and the French officials were not able to discuss the results. "It's a very, very gruesome and arduous task, but they're going to have to look at mechanism of injuries," Brooks said. "How did these people die?" The types of injuries the victims suffered will tell investigators a lot about what happened to the plane, he said. But the focus for investigators and search teams in the Atlantic remains finding the plane's cockpit voice and flight data recorders, which send out an electronic signal for at least 30 days after a crash. Searchers are using sensitive audio equipment to listen for the recorders' beacons, Ferrante said. The mountainous ocean floor in the search area ranges from 3,280 to 15,091 feet, BEA officials said, making the search for the recorders -- and the rest of the plane's debris -- difficult. "It is as if it fell in the Andes," the BEA's Ferrante said. Even if the recorders are recovered, the mystery may not be solved, Arslanian cautioned. "I cannot say to you that when we have them we will have everything, we will know everything," he said. "And I cannot say that if we don't have them, then the inquiry is stopped." CNN's Jim Kavanagh contributed to this report.